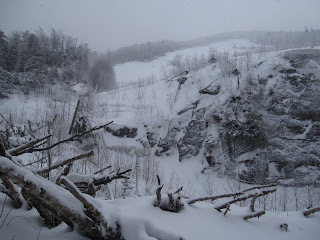 Yesterday’s backcountry ski excursion served as my annual New Year’s Day ski to Avalanche Pass, just one day late. This classic ski trip is one every off-piste skier lucky enough to pass through the Adirondacks should try. 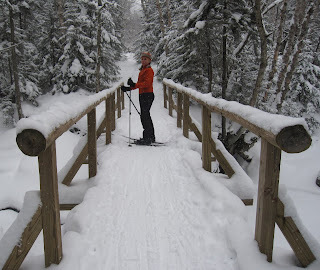 An easy half-day adventure in the woods, a ski to Avalanche Pass is worth the trip for all easterners who call themselves backcountry skiers. 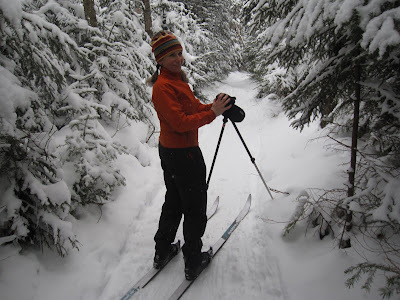 Although the approaches to skiing to or through Avalanche Pass are varied, I usually start my ski at the Adirondack Mountain Club’s facility located on the Adirondack Loj Road, near Lake Placid, New York. 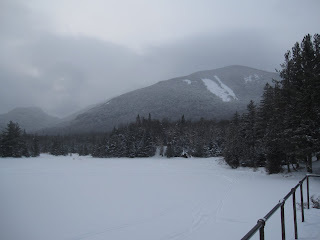 Conditions for yesterday’s reverse palindrome ski (01/02/10) were pretty good. Normally rocky areas were still pretty boney due to lack of snow depth and the heavy, holiday, massive snow-plowing, beginner traffic. The foot of very light snow that fell here at the homestead in the last 18 hours should translate into at least 18 inches up high, so it is safe to say the rocks and steps now have adequate coverage. Here is a link to an old story I did on this ski, with plenty of photos. Enjoy yesterday’s pictures above and below. Angel Slide from Marcy Dam. Crossing Marcy Brook just before Avalanche Camps.